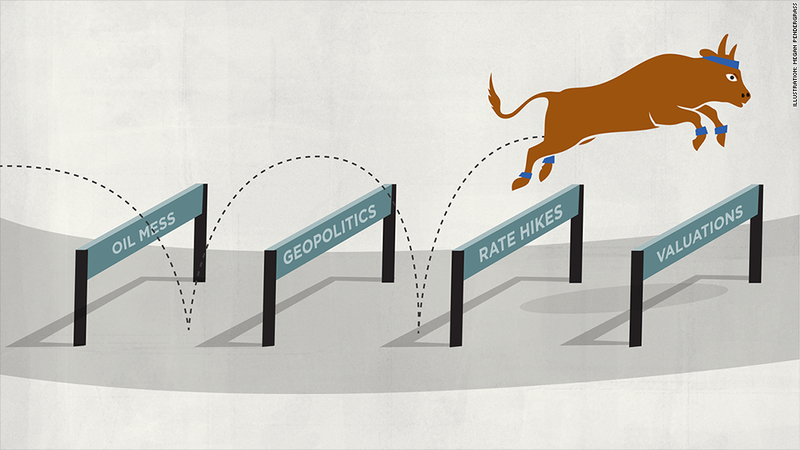 The bull market may need to tap the brakes in 2015. That doesn't mean the party is over for stocks. Investing pros surveyed by CNNMoney expect the S&P 500 to climb to 2,184 by the end of next year, implying an 8% gain from Friday's close. It would be a solid gain, but not as spectacular as recent years when double-digit increases have been the norm. The obstacles are growing heading into the New Year. Higher interest rates and sluggish global growth will hold the stock market back, experts predict. "Valuations are not particularly compelling, so a shift in sentiment caused by anything could see stock prices decline," said Adrian Day, president of Adrian Day Asset Management. Despite the caution about 2015, the U.S. economy still looks like the best house in a bad neighborhood. Europe and Japan are on the verge of recessions and China is slowing, but U.S. growth has accelerated in recent quarters. That's fueled the best year for American job creation since 1999 and raised hopes consumers will finally be rewarded with higher wages. There's hope the U.S. economic growth will translate to stronger corporate earnings, the lifeblood of stock prices. Higher earnings normally translate to higher stock prices. Central bank questions swirl: Yet that economic progress is also stoking uncertainty among investors because it's freed up the Federal Reserve to hike interest rates next year. No one knows how a stock market that's become addicted to easy money will react to higher rates. If the central bank fumbles the first increase since 2006, both the bond and stock markets will react negatively. Investors are also nervously watching central bankers experiment with emergency actions in Europe and Japan to stimulate those economies. The fact that more easy money is being provided seven years after the financial crisis highlights the continued risks to global growth. "There are a variety of risks that include Abenomics failing to work in Japan, a hard landing in China, or a worse-than-expected slowdown in" Europe, said Kristina Hooper, U.S. investment strategist at Allianz Global Investors. "We are also concerned that a potential global growth slowdown could negatively impact the United States." Geopolitical, valuation jitters: A number of the experts CNNMoney surveyed said the biggest risk facing stocks is the threat of a geopolitical shock, especially one involving embattled Russia. Others are more concerned that the stock market looks frothy and is fueling excessive optimism. $60 oil prices: Survey respondents were taking a more nuanced approach to the recent meltdown in energy prices that has caused crude oil to tumble below $60 a barrel. "In the short-term, a decline in crude oil prices will help the economy by putting more dollars back into consumer wallets, decreasing transportation costs and helping manufacturing," said Fatima Iqbal, senior investment strategist of the Azzad Wise Capital Fund. The flipside of that is a slowdown in capital expenditures by oil companies that will cast a shadow over the biggest driver of recent job growth. The strategists polled by CNNMoney expect crude oil to bounce back from current levels and end next year at about $74 a barrel. 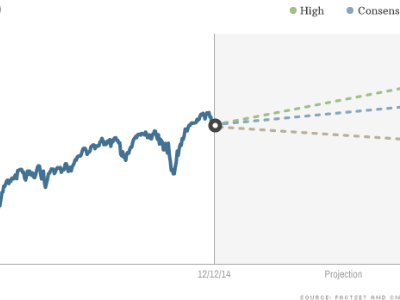 2015 game plan: So how should investors position themselves heading into 2015? The investing pros still recommend overweighting stocks, but they also urge clients to sock away some money in bonds and a small amount in cash. "The Fed is going to be boringly predictable with rate hikes, so investors can just ride out any short-term turbulence in the bond market," said Brian Jacobsen, chief portfolio strategist at Wells Fargo Funds Management.